There are multiple challenges to agriculture in Guatemala's dry corridor, for example extreme weather events (prolonged droughts, erratic rainfall, and frost), land degradation, water scarcity, and poor land management. These events, resulting from climate change, affect as much as 300.000 households (18.7% total national population) and resulted in 55-100% yield losses for maize and beans. In response to this yhe Ministry of Agriculture, Livestock, and Food (MAGA) is providing farmers with incentives to adopt climate-smart agriculture (CSA) that aims to increase productivity, resilience and ow-emissions development. 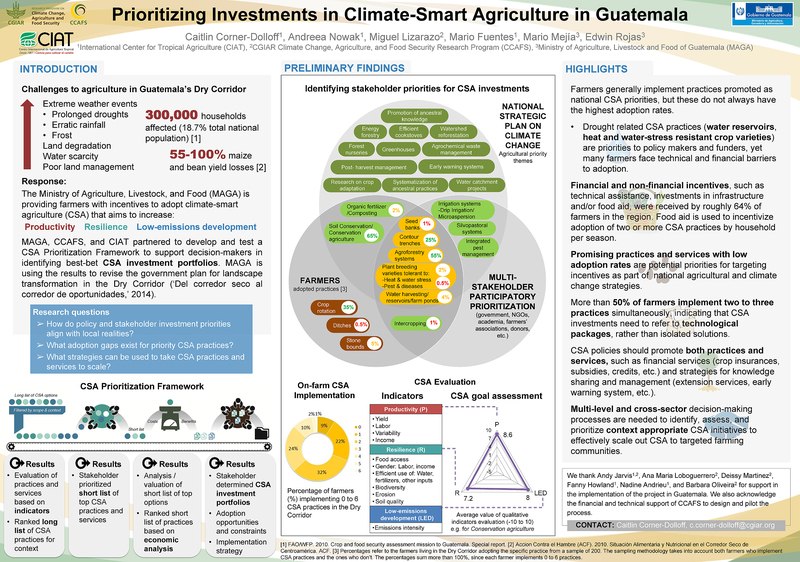 MAGA, CCAFS, and CIAT partnered to develop and test a CSA Prioritization Framework to support decision-makers in identifying best-bet CSA investment portfolios. MAGA is using the results to revise the government plan for landscape transformation in the Dry Corridor (‘Del corredor seco al corredor de oportunidades,’ 2014). - How do policy and stakeholder investment priorities align with local realities? - What adoption gaps exist for priority CSA practices? - What strategies can be used to take CSA practices and services to scale? Farmers generally implement practices promoted as national CSA priorities, but these do not always have the highest adoption rates. - Drought related CSA practices (water reservoirs, heat and water-stress resistant crop varieties) are priorities to policy makers and funders, yet many farmers face technical and financial barriers to adoption. Financial and non-financial incentives, such as technical assistance, investments in infrastructure and/or food aid, were received by roughly 64% of farmers in the region. Food aid is used to incentivize adoption of two or more CSA practices by household per season. Promising practices and services with low adoption rates are potential priorities for targeting incentives as part of national agricultural and climate change strategies. More than 50% of farmers implement two to three practices simultaneously, indicating that CSA investments need to refer to technological packages, rather than isolated solutions. CSA policies should promote both practices and services, such as financial services (crop insurances, subsidies, credits, etc.) and strategies for knowledge sharing and management (extension services, early warning system, etc.). Multi-level and cross-sector decision-making processes are needed to identify, assess, and prioritize context appropriate CSA initiatives to effectively scale.